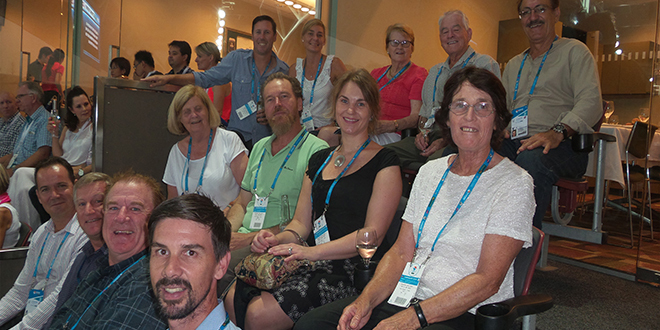 Celebrating success: Queensland Catholic Lawn Tennis Association voluntary board of directors members enjoy an evening at the recent Brisbane International. DOOMSAYERS who’ve written off club tennis may need a rethink given the experience of the Morningside Tennis Centre. Not only is the centre, also headquarters to the Queensland Catholic Lawn Tennis Association, going from strength to strength in its membership base but also it took out two awards last year. The centre and the operator, TennisGear, were awarded Qld Tennis Club of the Year and also the John Newcombe Award for Australian Club of the Year 2014. Earlier last month, the voluntary board of directors were rewarded for their efforts by an invitation from Tennis Queensland to the Brisbane International. “It was a wonderful night,” QCLTA board of directors’ member Lois Palmer said. Ms Palmer said there were several reasons for the latest success of the centre, which has a proud tradition in Catholic club tennis stretching back to the 1920s. “There’s a tremendous investment in the next generation of players with more than 700 children being coached each year,” she said. “The organisation has an expert team of managers and coaches, highly qualified as well as trainees. Fun social activities are also offered, including an interdistrict match each year with the Gympie Tennis Association. The Morningside Tennis Centre was chosen from eight finalists for Qld Tennis Club of the Year. Ms Palmer said the award was based on a wide range of criteria. “These included achieving membership growth, accessibility, participation, coaching pathways, staff expertise, tournaments, competitions, interclub activity and upgraded club facilities,” she said.